please contact the Superintendent to be put on the list of visitors. Upon request to the Superintendent, Western Brown shall make reasonable accommodation for a disabled person to be able to participate in this activity. Mrs. Hildebrandt has served on the board for many years and is one of Western Brown's most devoted fans. JoAnn loves to support our students by attending many functions throughout the year. Scott Moore is serving in his first term. Scott and his wife, Connie live close to Hamersville and Scott works for the county engineer. Mrs. Lynette Garrett is in her second term as a member of the Western Brown Board of Education. She is an art teacher at Georgetown Exempted Schools and strong supporter of arts education. Jennifer Patrick is a proud graduate of Western Brown's Class of 2003. After receiving a Bachelors in Business Administration from Wilmington College in 2007 and a Masters in Non-profit Management from NKU in 2013, she made it her goal to find a career where she could serve the Brown County community. 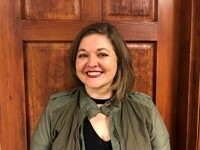 Jennifer is currently employed as HealthSource of Ohio's Community Relations Director and serves on the Brown County Chamber of Commerce-Board of Trustees. She believes that there is a strong correlation between health, academic achievement, community engagement, and local economic growth. She hopes that her time as a BOE member not only betters the students of Western Brown, but contributes to the growth and overall strength of Brown County. In her spare time, Jennifer enjoys being with friends and family, attending sporting events, getting outdoors and remaining active, and giving back to our community as much as possible. Mr. Richey Pride has been on the board for many years and is Western Brown's representative on the Southern Hills Career Technical Center Board of Education. Please access our Board Policies by clicking on the link below.